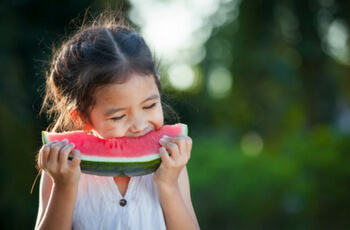 Made up of mostly water, watermelon is a great choice for your oral health. Fruit is a normal, essential part of any healthy diet—but knowing which kinds are also great for your teeth can help your smile beam for a lifetime. Before you reach for your next piece of fruit, consider staying away from too much of the following. Bananas: Though they contain plenty of vitamins and minerals, bananas are high in starch. Starch particles can become easily stuck in the crevices of your teeth, promoting bacteria growth. Lemons: Over time, the high acidity of lemons can damage and erode the enamel of your teeth. Pineapple: Pineapples aren’t just highly acidic—they’re also high in sugar. Eating too much can trigger tooth pain or sensitivity. Of course, bananas, lemons and pineapple have health benefits that stretch beyond your teeth. If they’re a staple in your diet, brush or rinse your mouth after eating them. Apples: This crunchy fruit is excellent for helping to clean your teeth while also fighting smelly breath. When eating, leave the skin of the apple on for the best benefits. Strawberries: Strawberries aren’t just great for your teeth—they promote healthy gums, too. They’re high in vitamin C, which aids in the body’s production of collagen. Collagen is critical for helping your gums maintain their strength. Kiwi: Though it’s often mistaken for a citrus fruit, the kiwi is actually considered a berry. It’s packed full of calcium, which is great for your teeth as it helps to neutralize acids while boosting the health of your enamel. Remember to stay on top of your oral health by visiting our practice for routine checkup and cleans. We look forward to seeing you soon!